I’m not even exaggerating, you guys! I took one bite… dropped my fork, and ran to get my camera. Then, I fluffed that potato back up (Ha!) so you couldn’t see my bite, and snapped a picture for you. And for me. Because I never want to forget how delicious this darn thing is! Please do yourself a favor and give this quick and easy lunch a try, because your tummy (and your thighs!) will thank you for it! Stab the sweet potato all over with a fork. 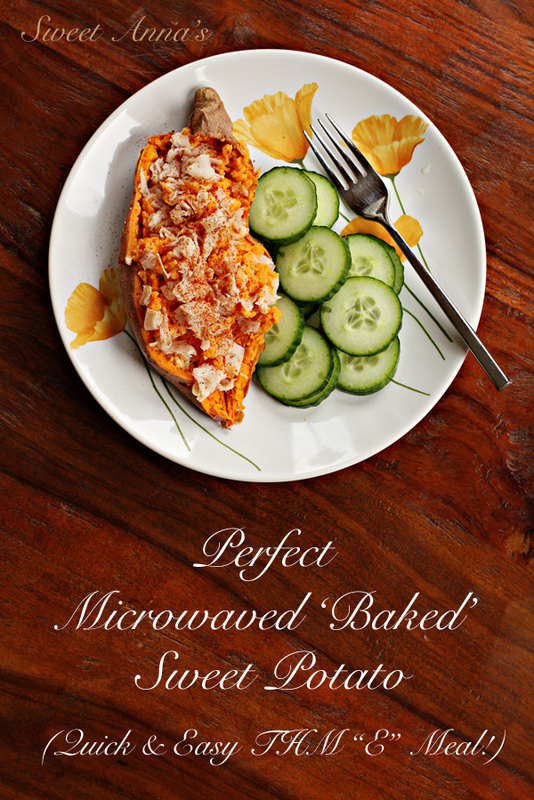 Place in the microwave and bake on HIGH for 8-10 minutes, until the sweet potato is very soft. Cut the sweet potato in half and carefully scoop out the flesh of each half into a small bowl. Add in the rest of the ingredients and stir it up with your fork, fluffling as you go, to melt the cheese and coconut oil. Taste for seasoning, add more salt or chipotle and scoop back into the sweet potato peels to serve!